Echo Lakes is a busy place. This scenic oasis, a few miles in from Highway 50, usually has a parking problem due to its popularity with the many cabin owners, the chalet/store, and the PCT trailhead to miles of trails further into the Desolation Wilderness. It is the easiest access into the Wilderness, which is only 5 miles in from the trailhead, but many people enjoy the trail in towards the boundary also. There is a water taxi available from the marina to the upper end of the lakes that shortcuts 2.5 miles of the trail along the east side($$). Directions: Drive 46 miles east on Highway 50 to the Johnson Pass Road, it goes left half a mile to Echo Lakes Road where you go left again for another .9 miles to park in the larger, upper parking lot, not the temporary parking down at the lake. The trail north starts at the Echo Lake Dam near the information kiosk with wilderness permits (for day use only) if you plan to make it that far. Overnight wilderness permits must be obtained at either Pacific or Placerville Ranger stations or online. This trail is popular because it starts at higher elevation than most trails into the wilderness making it easier, and the scenery is awesome. The trail also has connections to many other trails in the wilderness or out to Fallen Leaf Lake and Lake Tahoe. The main Pacific Crest Trail going south leaves south from the upper parking lot. It takes you 1½ miles to Highway 50 where you could also park to hike south. (see map). 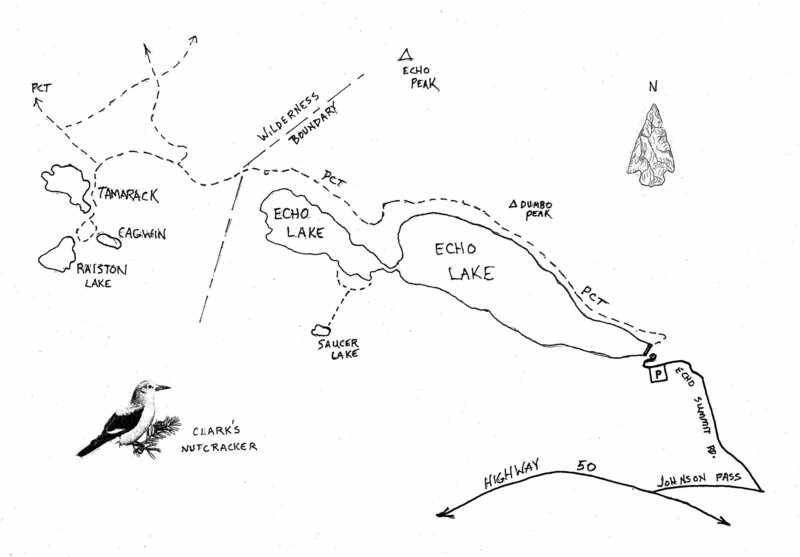 History: Echo Lakes is near the old Johnson Pass, a route you can still drive as a road today. Indians for many years used to meet near the pass for trading. The Washoe from Lake Tahoe area would meet with the Sierra foothills Maidu or Southern Nisenan. Once Hawley’s Grade was finished in 1858 wagons could finally make the grade without block and tackle. A tunnel was built to divert Echo waters into the South Fork American River, rather than its natural flow into Lake Tahoe. The California miners wanted water almost as much as gold.